The treadmill was introduced in Sydney in 1823 as a less brutal alternative to the lash, and authorities hoped it would be equally effective as a deterrent to further crime. 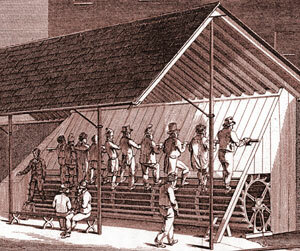 There were two treadmills in Sydney and they were used to drive mill wheels for grinding grain into flour. Residents could bring their grain along to have it ground at these convict-powered mills. The NSW Government charged a fee for this, so the joint goals of revenue-raising and deterrence are not unique to speed cameras - the aim was the same in the 1820s! Above right: a treadmill operating in Brixton Prison, London 1822 (Gentleman's Magazine 1822). 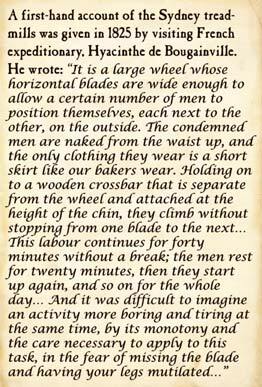 It is similar to the ones used in Sydney, but while London prisoners worked the mill fully clothed, convicts in NSW were naked from the waist up, according to an 1825 account (see below).